Ingredient Swaps to make your baking more nutritious......and still delicious! Do you find yourself always reaching for something sweet after dinner? It’s true, many of us have that sweet tooth- but the question is, how can we make that cookie a little more nutritious. Being aware of simple swaps like the ones below can help you easily spot how to quickly make your average recipe more supportive of brain and digestive health, and overall well-being! Many people don’t even notice the change in flavor. Try some of these swaps out in your next recipe- but be aware of ratio changes when making these swaps- you’ll often need more or less of your average ingredient. White flour has been shown related to inflammation via the upper gastrointestinal tract. In our gut health post, we discussed how to keep your gut healthy. Replacing white flour with options such as almond, oat, or coconut flour for your average white flour may help you gain some of the benefits associated with a healthy gut! 1. Almond flour: Made from (you guessed it!) almonds ground up into a flour, this substitute is lower in carbs than traditional white flour, high vitamin E (¼ cup i 35% of your RDI), magnesium and fiber (3 grams per ¼ cup)! Almond flour a great alternative for individuals consuming a gluten-free and grain-free diet. Sub 1 cup of almond flour for 1 cup white flour in your next recipe to reap the benefits. 2. Coconut flour: Created from ground-up coconut, this flour is gluten-free, grain-free, lower in carbs (16 grams vs 22 grams in one cup of white flour) and super high in fiber (a whopping 10 grams per one cup!). Coconut flour is also a great source of iron and potassium, about 2 mg and 350 mg per one quarter cup, respectively! Because this flour is highly absorbent, it cannot be subbed at a 1:1 ratio. Sub ⅓ cup coconut flour plus one extra egg with 1 cup white flour. 3. Oat flour: Who knew your go-to morning staple could be used in baking? Oat flour is simply made by blending oats in a food processor until flour-like consistency. Oat flour is gluten-free (make sure your oats are certified gluten-free to avoid cross-contamination). With 10 grams of fiber and 20 grams of protein per one cup, this flour is way more nutrient-dense than white flour! Sub one cup of oat flour for one cup white flour. Despite the bad rap sugar gets in our society, our bodies DO need sugar. Thinking “consume it then use it” when eating sugar can help us to utilize it for the energy we need in our day to day lives. Sugar has been shown to be a calorie dense, quick-source of energy when utilized in the right way. 1. Pure maple syrup: Research shows that pure maple syrup (not talking about Mrs.Buttersworth here!) has a higher antioxidant capacity than sugar and a lower glycemic index. Plus, a little goes a long way! Sub ⅔ cup of pure maple syrup for every one cup of sugar in your recipe. 2. Raw honey: Besides containing sugar, honey contains amino acids and antimicrobial properties. It’s higher ratio of fructose to glucose makes sweeter than normal sugar, meaning you can use less! Sub ½ cup of raw honey for every one cup of sugar. 3. Date sugar: made from dried chopped up dates, date sugar is technically not a sugar at all, but it acts like one! This sugar contains all the health benefits of whole pitted dates such as potassium, calcium, fiber and antioxidants. Sub ⅔ cup of date sugar for one cup of white sugar. Though butter has recently become hot topic in the health world- regarding possible cardiometabolic benefits- there is still much research to be done on the topic. Of course- everything in moderation, but if you have the opportunity to reduce some saturated fat with other beneficial foods, why not try it out! It may seem unlikely- but bananas, applesauce, nut butter, and canned pumpkin can serve as excellent substitutes for oil or butter! 1. Mashed banana: You’ll add in potassium, fiber and B vitamins while tremendously lowering the calorie and fat content! Sub up to 1 medium-sized mashed ripe banana with one stick of butter. 2. Unsweetened applesauce: By substituting ½ cup of applesauce for oil, you save over 900 calories, 109 grams of fat and add in vitamin C and some fiber! Sub ½ cup of applesauce for 1/2 cup of oil or softened butter. 3. Natural nut butters: Nut butters won’t lower the fat content, but you’ll increase the good fats (aka monounsaturated) and lower the bad ones (saturated fat)! You’ll also a considerable amount of fiber and protein (6 grams and 12 grams, respectively). Make sure you use the smooth, natural kind! Sub ¼ cup of nut butter with ¼ cup of butter or oil. 4. Canned pumpkin: Yup, canned pumpkin is not just for pumpkin pie. Similar to applesauce, you save loads of calories and fat. 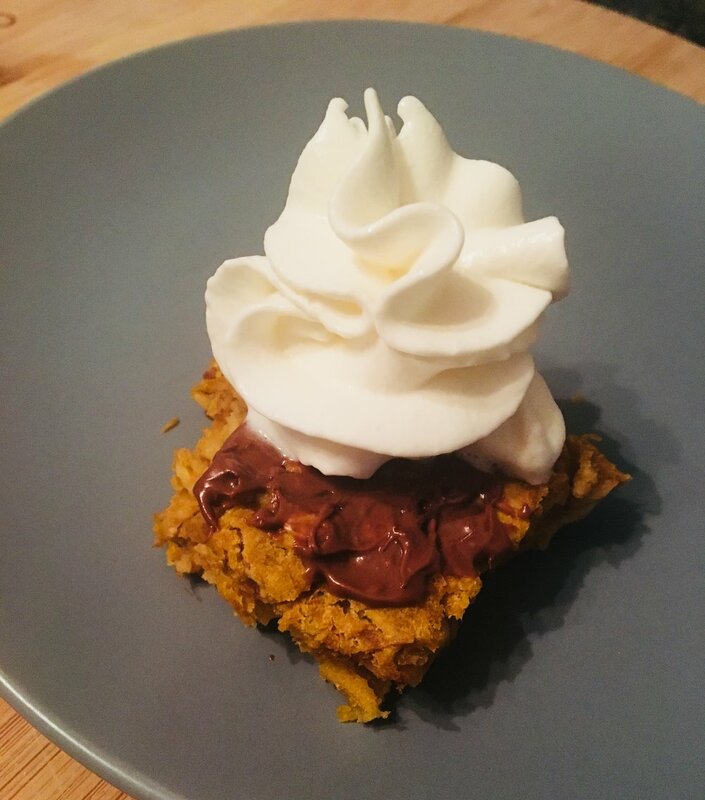 Additionally, pumpkin is a terrific source of vitamin A (280% of your DRI in ½ cup!). Sub 1 cup of pumpkin for one cup of oil. How are these cookies different from your average chocolate chip cookie? 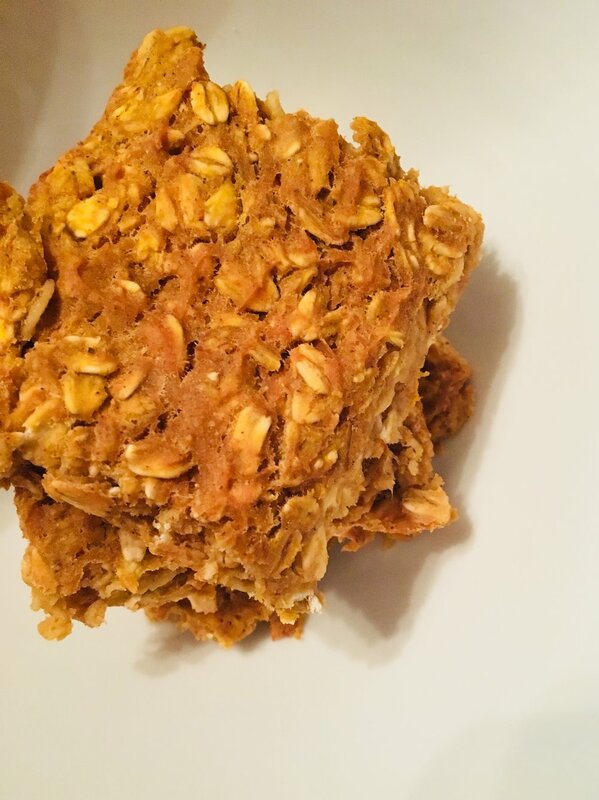 These cookies are made with almond flour instead of white flour, almond butter in place of butter, banana in place of the egg (and for sweetness) and only 2 tablespoons of maple syrup for sweetness, as opposed to at least ½ cup white sugar. 1. Preheat oven to 350 and line a baking sheet with parchment paper. Set aside. 2. Combine almond flour and baking soda in a large bowl. Combine mashed banana, almond butter and maple syrup in small bowl and mix well. 3. Add mixture to dry ingredients and mix well. Fold in chocolate chips and combine. Make topping by combining all ingredients together. Spoon batter into 12 cookies. 4. Bake for 15 minutes or until done. As nutrition students, we know balancing a busy life is difficult. One goal we make a conscious effort to attain is to ensure that we have a healthy snack on hand during our busy times. For instance, on the commute home from work, or when your lunch gets pushed back due to back-to-back meetings. Sometimes healthy means simply acknowledging that you are going to have a busy day, and preparing both mentally, and physically. Physically preparing for this day might mean taking some extra time to prep a snack for the day, since you know you might not be able to sit down for a full meal. Mentally preparing might include making a note or setting an alarm to remind you that you need to make time for this snack during your day. Setting small goals is important, especially when you know that it will help you avoid getting to that hangry, exhausted stage. Maintaining energy balance, and fueling our bodies is vital to our sustainability as human beings. In order to do this, we try to have snacks on hand with balanced nutrients. This might include a carbohydrate, protein, or fat. Each of these components works to fuel the body in different ways. This snack combines the perfect combination of whole grains + a healthy fat to help fuel your brain and your body. Old-fashioned oats are a slow-digesting carb that benefit blood sugar levels and promote fullness. The other carbohydrate in this snack is fruit! It is important to include carbohydrates such as fruits and whole grains in our diet because they are rich in vitamins, minerals, and fiber. The combination of these + fat from the nut butter helps keep us satisfied for longer, meaning we can keep ourselves fueled until our next meal. 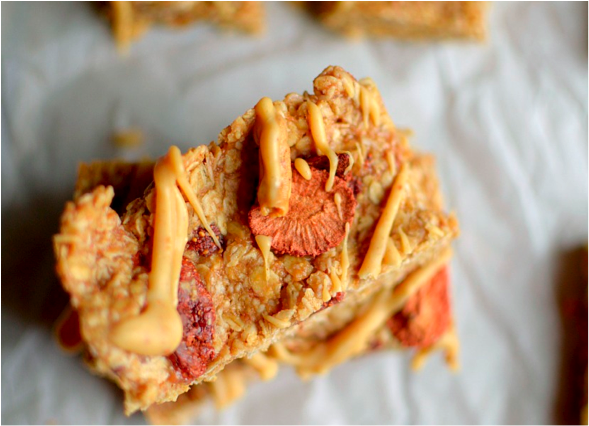 These No-Bake PB&J Granola Bars are the perfect on-the-go snack for busy people! They are made with super simple ingredients and don’t need to be baked! Mix together peanut butter and jelly in a large bowl. Add in dry oats and freeze-dried strawberries, stirring until mixture is combined well. Press down oat mixture into pan. Make sure it is in an even layer. Cover with plastic wrap and place in the fridge for at least 3 hours. Take out of pan and cut into 8 bars. Mix together glaze ingredients and drizzle on top of bars. *you can add a scoop or two of protein powder if you desire! Preheat oven to 325 degrees. Coat an 8 inch baking dish with non-stick cooking spray. 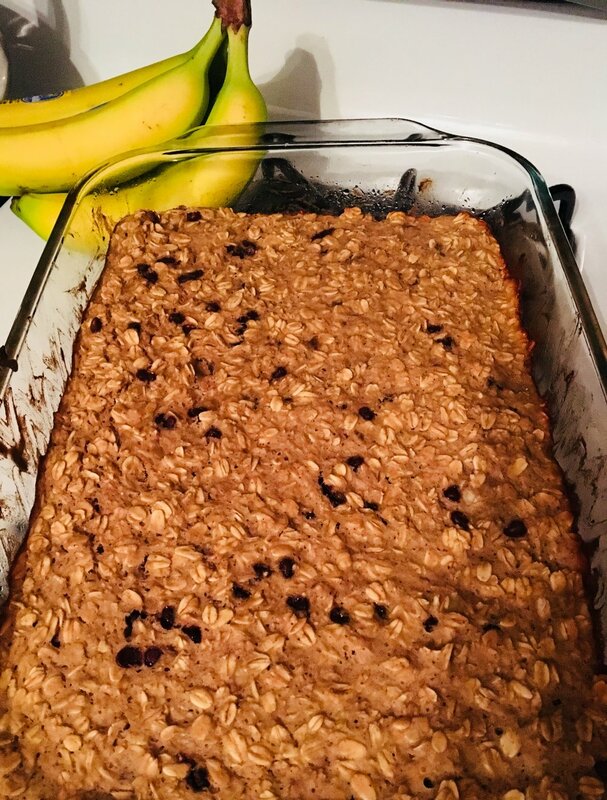 In a large bowl, mix 2 cups old-fashioned rolled oats, 3/4 dried cranberries (or raisins), 1 teaspoon baking powder, 1/4 teaspoon salt, and 1 teaspoon cinnamon. In another bowl, whisk 2 eggs, 1/4 cup maple syrup, 2 cups milk, 1 teaspoon vanilla, extract, and 4 tablespoons melted unsalted butter. Add this mixture to the oat mixture and stir to combine. 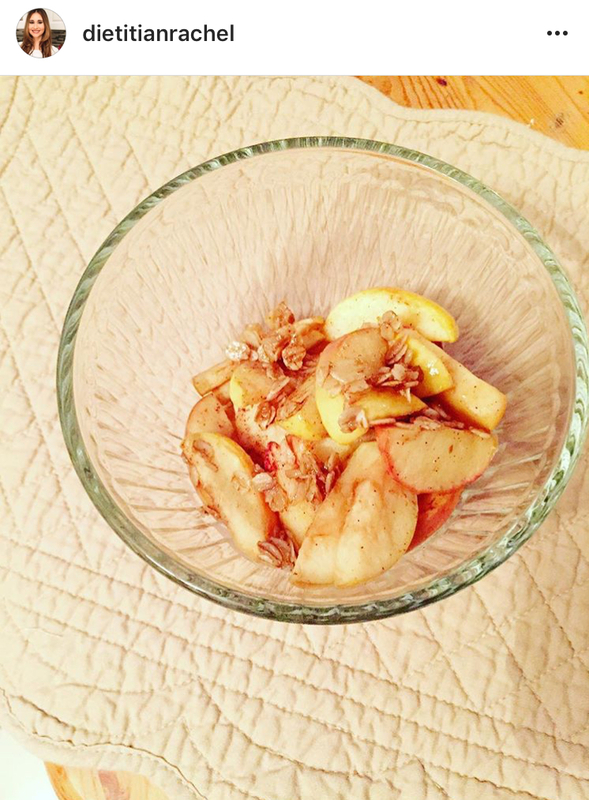 Stir in 1 finely chopped apple. Pour into baking dish. Sprinkle dried cranberries and slivered almonds on top. Bake about 45 minutes, until top is golden and set. Let cool slightly and cut into squares. Stress. We are constantly putting our bodies through it! Some of us work to combat stress; whether through yoga, taking a break from “screen-time,” or simply setting time aside for loved ones. However, have you ever thought of combating stress through your gut?! It might not be as trendy as that hot yoga class, but the gut, often referred to as our “second brain,” plays a vital role in stress. Recently, research has shown how our brain and gut work together to regulate our food intake, metabolism, body weight, immune system and brain health. How does the food we eat impact our “second brain?” Well, the gut contains 50-100 million nerve cells (Mayer, 2016). Our diet can directly impact these nerve cells, as well as immunity cells, in a positive or negative way. If the gut senses dangerous substances in the food or liquids we ingest, it signals these immune cells to fight off bacteria and protect us from harm (Mayer, 2016). Most importantly, the gut contains the largest amount of serotonin in our body (more than 95 percent)! Serotonin - which is vital to maintaining our mood, sleep cycles, and digestion - makes sure this pathway between the gut and brain stay in constant communication. Because of this communication, that “gut feeling” you get is not just a myth. Information from the gut is actually stored in the brain! This can impact not only decisions around the food we eat but also everyday actions including decisions made in socializing or working(Mayer, 2016). So how can we make sure this pathway, and our overall health, stays intact? Here are some tips on foods to avoid, and include, as well as a yummy gut-healthy dessert! ● Dairy: casein and whey hard to digest, causing gut bacteria to ferment milk sugars. ● Gluten: most people are sensitive to gluten, which creates inflammation. Research shows that going GF helps with inflammation. ● Corn: most corn produced is GMO, causing similar effects as soy. Mayer, E. A. (2016). The mind-gut connection: How the hidden conversation within our bodies impacts our mood, our choices, and our overall health. New York: Harper Wave. 1. Preheat oven to 350 and line a muffin pan with silicon baking cups. 2. Puree sweet potatoes in food processor. 3. Add in almond butter and combine. 4. Add in protein powder and combine. 5. Add batter to a bowl and mix in chocolate chips. 6. Divide batter among 9-12 baking cups and bake for 25-30 minutes, or until done.